Discussion in 'Non-code bugs' started by Awpolt, Mar 25, 2017. I have noticed a few oddities with emp_cyclopean. 1.) 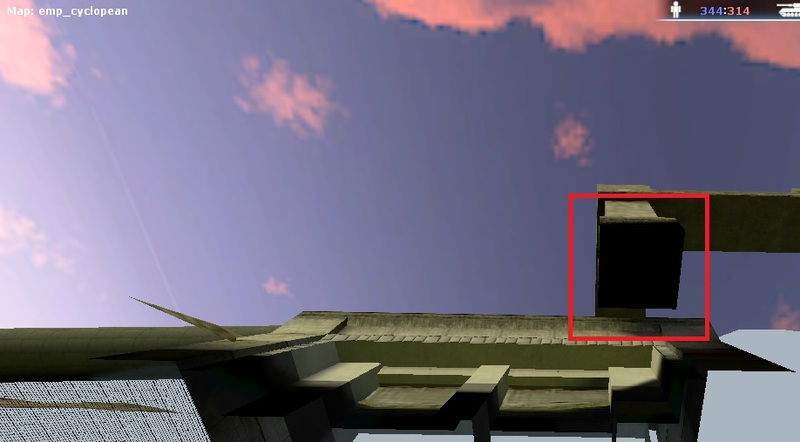 Moving your camera around the circled area will cause the texture to appear to be moving inside the garage door texture. 2.) Texture is being rendered but cannot be seen. Seems to occur in many places. Pillar adjacent to above location. 3.) Skybox lines can been seen. This seems to be a common occurrence on several maps. 4.) Self-explanatory hole in the map. 1. That is not a circle. I addressed issues 1, 2, and 4. 3 requires someone with a better art sense and skill than myself.